Here’s something you don’t see everyday: a stand up workstation featuring a MacBook Pro attached to two dual vertically orientated monitors. There are plenty of studies that show the ergonomic benefits of having a standup computer desk and workstation. 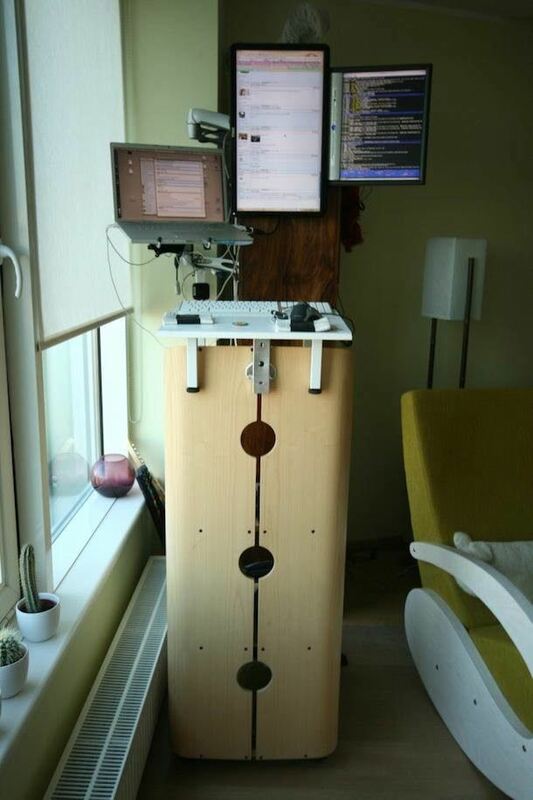 I’ve always been curious how it’d feel to work on a computer while standing, I’ve even seen some standup workstations that have treadmills so people can walk while working… cool idea but I don’t know if I’m coordinated enough! I know this workstation belongs to one of our readers, but I can’t seem to remember where I found the image. If this is your setup, feel free to claim it in the comments. yeah William, it’s mine. been following your mac setups feed for a while, i think its a great idea to post these. i originally posted the picture to the Estonian biggest computer forum hinnavaatlus.ee thread called “Show off your workstations”, how did you end up stumbling on this? since this picture was taken i have done away with the white table mid-section, i’ll post an updated shot in the morning. Unless I am mistaken, the monitor on the right is for IRC? I’d guess irsii? yep, irssi inside tmux, with some terminal transparency so skype can shine through. and of course – thanks for publishing! haven’t had time to set up my v2 of this yet, esp. since i’m considering moving to another country, but it’ll be awesome when i get it done.